Made famous by the American war (and the TV show), China Beach (or Non Nuoc as it is known in Vietnam) first rose to fame when its close proximity to Da Nang led to it being used as an R&R destination for American soldiers. 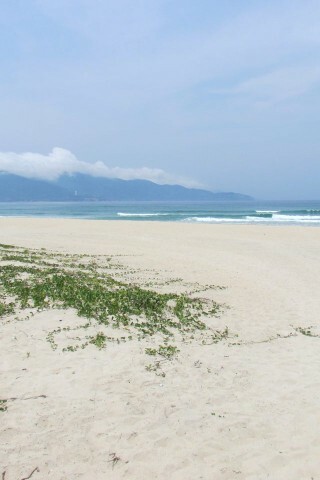 Browse places to stay in Da Nang on Booking.com. Book Now - Pay Only When You Stay. Though subsequent decades left it with a tranquil vibe of abandonment, the crowds have returned once again, so though Non Nuoc initially avoided the over-development that other beaches like Nha Trang undertook after Vietnam opened its doors to tourism, it’s now looking to become the country’s next big beach resort. On an earlier visit in September 2008, the vast stretch of beach, from the Son Tra peninsula to the north down to Cua Dai beach outside Hoi An to the south, was being prepped for a massive transformation. Thousands of acres of beachfront property had been appropriated by the government for use by international hotel conglomerates to build four- and five-star luxury resorts, and major chains. Fast forward to 2014 and despite a large influx of resorts and villa complexes, including the Crowne Plaza, Hyatt, Fusion Maia, Vinpearl, Intercontinental and a couple of golf courses, it’s still a huge development site and most of the beach is still fenced off awaiting construction -- making it inaccessible to the public. The half-demolished buildings have been joined by half-built resort projects abandoned during the recent global recession. Some building has recently started again in earnest though, and a few new resorts opened their doors early in 2014 – the Pullman Resort and A La Carte are two standouts. More resorts are earmarked for completion by the end of the year, although at this stage it’s quite difficult to imagine they will be ready in time. Browse our independent reviews of places to stay in and around Da Nang. Read up on where to eat on Da Nang. Check out our listings of things to do in and around Da Nang. Read up on how to get to Da Nang, or book your transport online with Baolau. Planning on riding a scooter in Da Nang? Please read this. See below for more sights and activities in Da Nang that are listed on Travelfish.org. Where are you planning on heading to after Da Nang? Here are some spots commonly visited from here, or click here to see a full destination list for Vietnam.